When it comes to full sized sedans, the Nissan Maxima ranks highest among the likes of the Toyota Avalon, Hyundai Azera, and the Chevy Impala. Straddling the line between practicality and luxury, The Maxima is a premium-tier car that offers standard luxury elements for a comfortable ride. Heated leather seats make for smooth entry into the spacey cabin, and an infotainment system rounds out the comprehensive and practical interior. At the front end Nissan created a “V-Motion” look that makes its curbside presence hard to ignore. But there’s always room for enhancement; just when you think you’ve been wowed, the RGB demon eyes LED strip module engages and you get blown away. 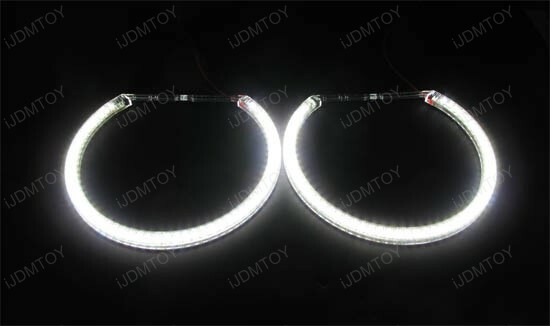 LED halo rings can be spotted in many sporty cars such as the Scion FR-S, Chevrolet Camaro, Ford Mustang, and Dodge Challengers. Angel eye halo rings accent projector head lights in such a way that commands attention and awe from other drivers and pedestrians. 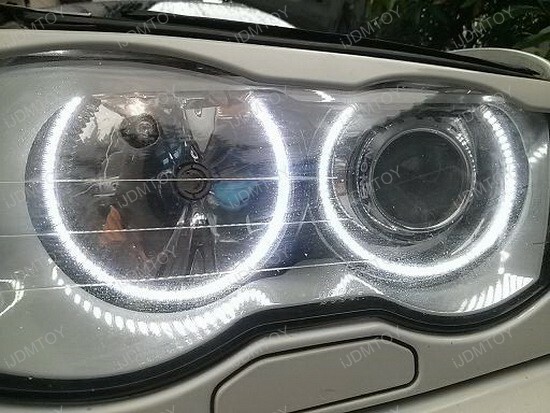 And while many cars are capable of sporting head lamp halo rings, perhaps they are most synonymous with BMW sedans that carry kits such as the 7000K xenon white SMD LED BMW angel eyes halo rings. 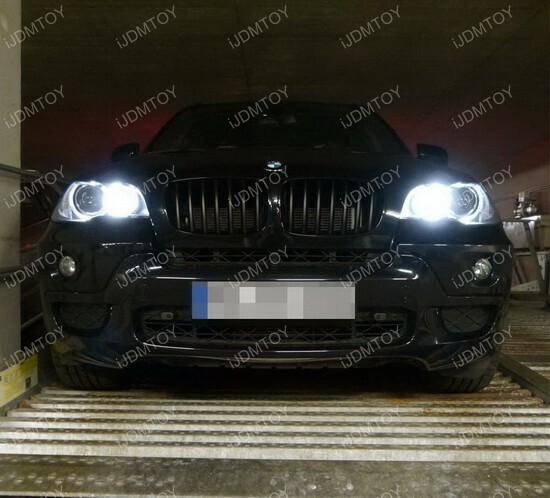 The 360 Degree 80W CREE High Power H8 LED BMW Angel Eyes Ring Marker Bulbs for BMW are much, much brighter than their factory incandescent counterparts. 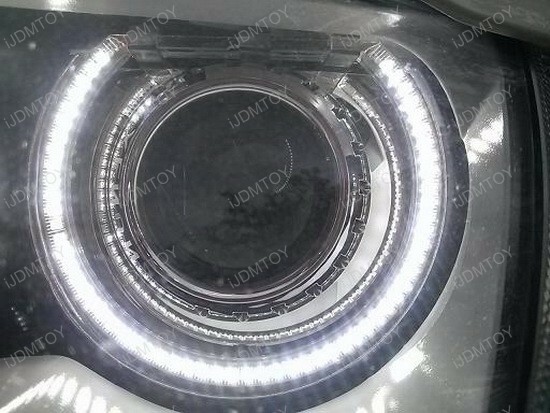 The LED Angel Eyes just look so much more energetic and don’t have that dull yellow glow that plagues so many vehicles on the road today. There are no modifications needed for this application, as the BMW Angel Eyes are simply plug and play. There aren’t any wires hanging outside of the headlight, for a clean and classy look. 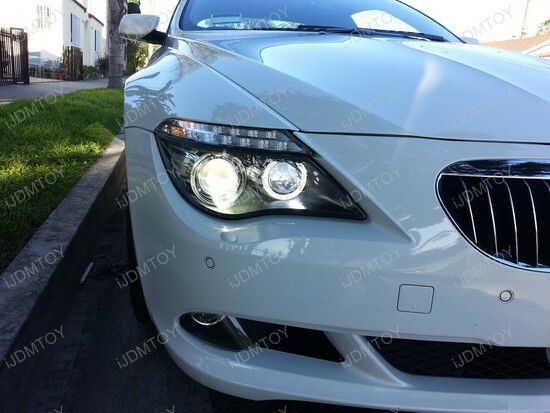 This BMW 650i looks incredible with the all new 10W high power BMW Angel Eyes ring marker bulbs! 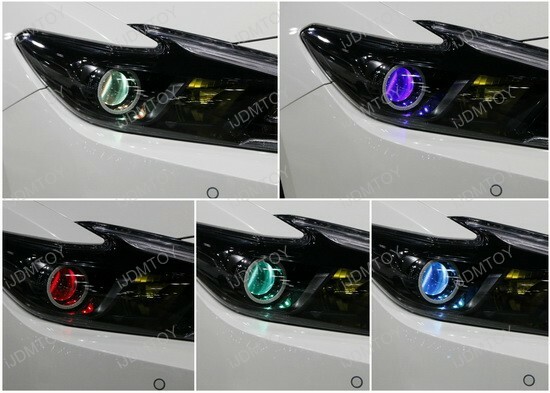 What a marvelous combination of HID headlights and BMW LED Halo lights. These pictures are taken in super bright daytime and as you can see, the stunning effect of such LED accessories is still visible! If you look closer, you’ll notice the difference between the all new extremely bright bulb vs. the stock bulb. Anyway, the featured BMW 650i is a gorgeous beast that will make you feel amazing once you see it. 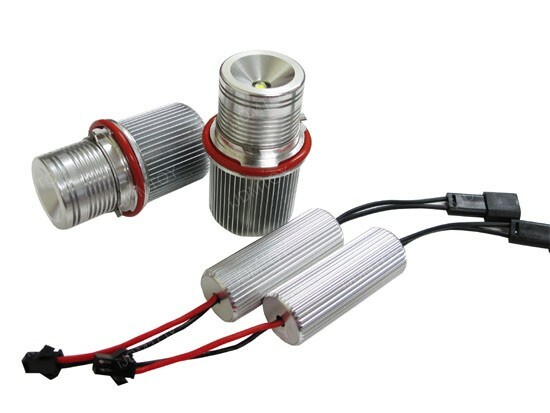 This high power bulb will get rid of the dull yellow look for a premium HID matching look like the all 2011 BMW E92 3 Series and 2011 BMW 5 Series’ OEM BMW Angel Eyes. 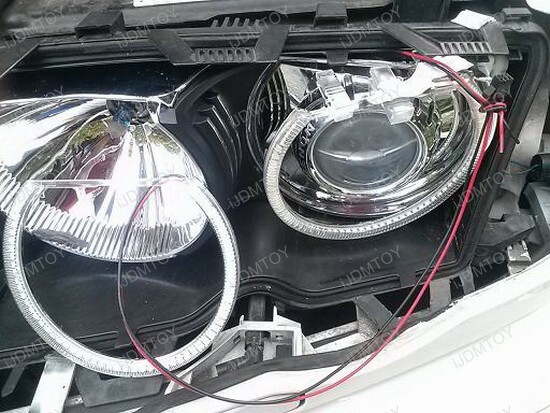 The 7000k Xenon White HID matching color shines with 1200 lumen lighting output that is more than enough! But let’s get straight to the point – each bulb has built-in CAN-bus controller and you don’t have to worry whether an OBC error will pop up on the dashboard. Completely plug and play, this product will work for many BMW models, listed on the product description page on the iJDMTOY online shop. Installing is completely plug and play, just find the wire that goes to the Angel Eyes bulb at the back of the light assembly, twist out the old light module, unplug it, plug in this module, and twist this new light back in. 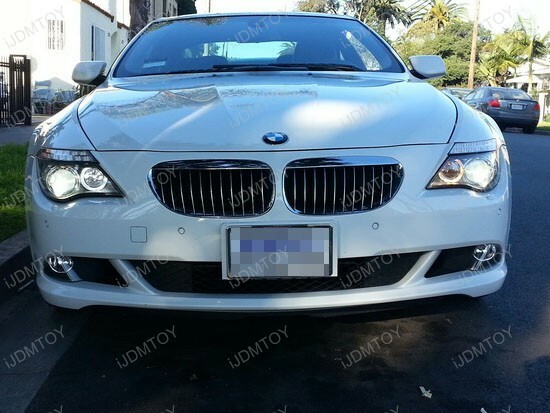 The BMW 650i and all 6 Series set the bar very high for many aspects, but true fans always look for available improvements and certain level of customization – these Xenon White BMW LED Halo lights are perfect choice for all the fans. 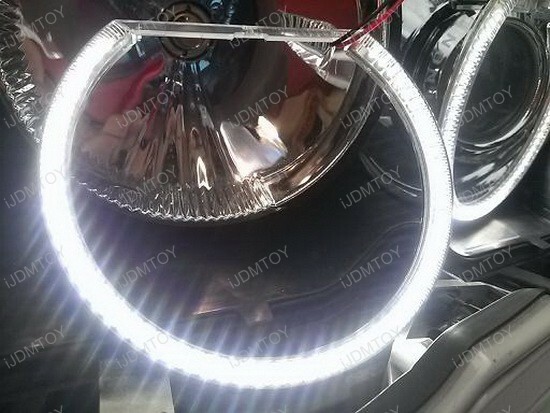 Producing a powerful crisp white light, that is simply outstanding, you can give your bimmer even more aggressive and stylish look – just go for it and visit iJDMTOY. 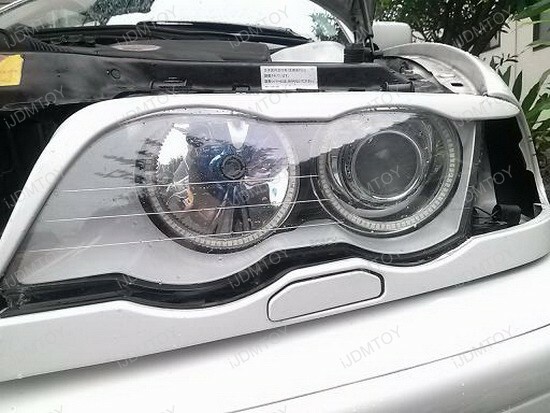 If you own a BMW E46 3-Series and are tired of looking at other BMW’s such as the newer 3-series models which come with bright and vibrant LED angel eye rings, we have a solution for you! We have designed a specific kit to fit the E46 to give it a newer, updated look that sets you apart from the other E46 models out on the road. Do not be intimidated by the installation procedure of opening the original headlamps, the E46 is not sealed with adhesive unlike other car headlights, it is sealed with rubber grommets and seals which can be easily removed by following the DIY (Do It Yourself) guides we have available on our website. The overall installation may seem difficult, but by carefully studying the DIY guide and taking your time, it is a very reasonable and modest install. 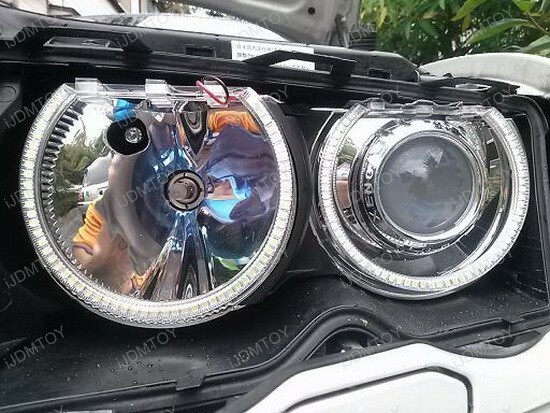 With these LED angel eye rings, they offer many advantages over conventional CCFL style angel eyes you see on the market such as; no blind spots around the ring, they are six (6) times brighter, and they are much more reliable. Each LED ring contains 66-SMD 1210 LED chips which produce a vibrant 7000K color that will definitely turn heads anywhere you drive.